When people have done their time, they should be cut loose, not made to jump through more hoops and shackled with threatening devices that follow their every move. Which is why we believe it’s time to stop electronically monitoring people on parole. 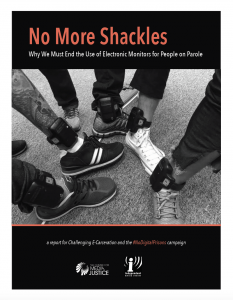 Today we’re releasing the “No More Shackles” report, produced in partnership with the Urbana-Champaign Independent Media Center, which outlines six reasons why the practice of putting ankle shackles on people on parole has got to go—from its impact on mobility to the way it extends government surveillance of people of color. Electronic monitoring is not an alternative to incarceration, it’s an alternate form of incarceration. Together we can change the narrative and ensure that when people are released from prison, they are truly let go. It’s time to demand #NoMoreShackles.